that was foreign to the face. She had never looked like that. annoyingly asked why I was staring at her. But I knew her secret — she just acted tough. acquired a thick shell that hid her true feelings. when the drama at home became strained. and was repaid with a puppy dog hug. Was not my Nan Nan. new outfit she’d bought just for me. Ten rows of chairs, eight across, filled the room. about anything other than my why they were there. and introduced new additions to their families. They hushed as a priest led the small group in prayer. He never knew her, but called her a “Good Soul” anyway. It was strange to hear him call her Charlotte. the still body behind him was my old friend. my Pop Pop, slowly approached the coffin. as he bent over the top of the casket . His trembling hand softly touched the corpse’s cheek. He kissed her and trembled, shaking as he turned. The mortician gently helped him walk away. His two sons, Nan Nan’s stepsons , kissed her next. Then, in an order unrehearsed, it was my turn. I knelt before the box and fought my fear. I felt like a child again, worried she’d yell if I stared. Shaking, I stood and leaned over the coffin. the other was amputated years ago, a sacrifice to diabetes. She was pale. The funeral parlor make-up was unnatural. I hesitated, then kissed a cold cheek and turned away. I had touched my lips to a powdered statue. after shaking his hand and heading for the parking lot. Pop Pop and I were alone after the casket was carried away. Note: The picture is of Nan Nan, our grandmother, and the Allen kids (l to : David, Donald, Michael, Jean, Kathy, Chuck and Ricky in Nan Nan’s arms). Circa 1960, Roslyn Heights, Long island. And we have a day off from high school. Watching the funeral procession on the tube. Someone forgets to close the door. Upset, Jim pushes the door closed. Jim shoves his body against the door. She smelled as I rummaged for a Coke. Her head cocked at an unnatural angle. 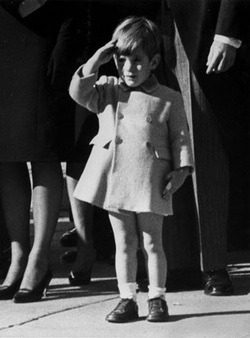 As JFK’s body is laid to rest. As his dad’s flag-draped casket passes by.